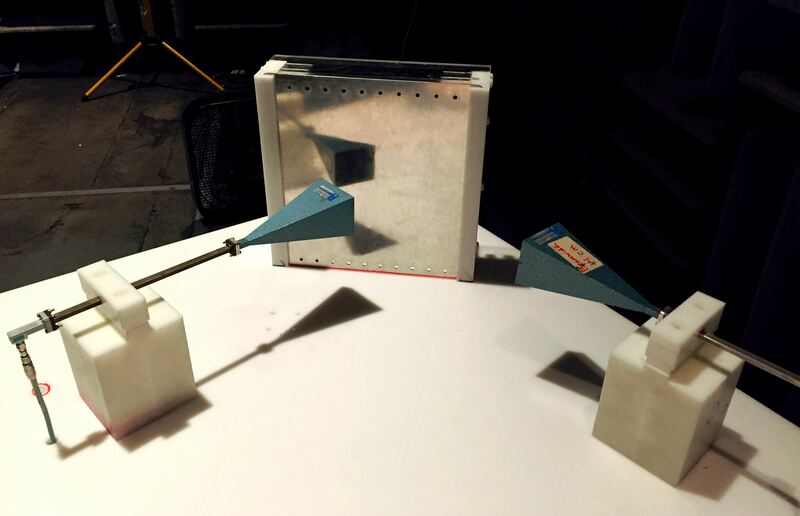 DNB Engineering, Inc. has developed a custom Reflectivity Test Method. This method enables DNB to measure the reflectivity of composites or other materials from 8 to 40 GHz. The fixture combines mechanical stability and a high performance Network Analyzer for the measurements of the reference material, typically aluminum, and the composite material. This insures repeatability. Samples can be measured within .1 db of the reference material. This entry was posted in DNB Updates, EMC Testing Updates, EMC Updates and tagged aerospace, certification testing, electromagnetic compatibility, emc, EMC testing, EMI testing, environmental test, HIRF testing, Reflectivity Test, Reflectivity Test medthod, test lab, testing. Bookmark the permalink.